Ludhiana,20 March (Mehak) The students of HOSTEL of Guru Nanak Girls College, Model Town, Ludhiana bid farewell to their seniors at a party hosted by them on 19th March 2008. The function was presided over by Principal, Dr. (Mrs.) Charanjit Mahal and President of Guru Nanak Education Trust, S. Gurbir Singh. 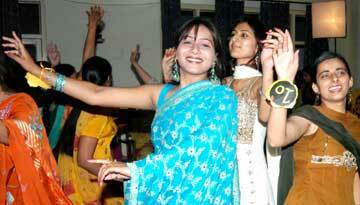 On this occasion Students presented a multi coloured cultural programme of dance, songs and skits. A beauty pageant- Miss farewell 2007-2008 was also organized. Senior students walked the ramp in colourful dresses. The winners of Miss Farewell were selected after two rounds. In the first round, students gave their introduction and in the second round they answered well to the question asked by Judges. The duty of the judges was performed by Mr. ( Er.) Amrinder Singh, Dr. (Mrs.) Daisy Aujla and Mr. Surinder Pal Singh Miss Shaminder was crowned Miss Farewell. Miss Manpreet & Miss Rupinder 1st and 2nd runners up respectively. Dr. (Mrs.) Charanjit Mahal crowned the winners and also advised the students to burn midnight oil for the approaching Annual Exams and come out in flying colours. Fun games were also played and students gave compliments to their respected teachers. Outgoing students presented gifts to the Principal and their teachers. A wave of cheer and joy prevailed everywhere.